While browsing Craft Beer and Brewing, I noticed they'd posted a clone recipe for Avery Brewing's "The Reverend" Belgian Quad. This is one of my wife's and my favorite beers, so naturally I jumped at the chance to capture the recipe here for later use. Note: This recipe differs from the way it's published on Craft Beer & Brewing because I've adjusted it for my own brewhouse environment with The Grainfather. Refer to the link above if you want the "official" recipe. Add 6.75 gallons of water to The Grainfather and heat to 148F. Add grain and mash at 148F for 90 minutes. Mash out at 170F for 10 minutes and then sparge with 1 gallon of 170F water. Wort volume should be 6.8 gallons, but if it's up to a half gallon below that it should be OK. Pre-boil gravity should be 1.086 SG or 21.5 Brix. If wort volume is lower it could be higher than that. Finished kettle volume should be 6.4 gallons at 1.093 SG or 23.1 Brix. Chill the wort to 68F and pitch the yeast. Hold the temp at 68F for the first half of fermentation, then allow the temperature to rise as high as possible to promote attenuation. After pumping through the counter flow chiller and accounting for trub in the kettle, the volume in the fermenter should be approximately 5.5 gallons. There is an old mash technique referred to as "hochkurz" mashing, which stems from the German words for "high" and "short". This mash style starts at a higher temperatures than most and stays at each temperature for less time, thus "high temperature" and "short duration" at each temperature stage. The idea in a Hochkurz mash is to mash in two steps. The first step maximizes the beta amylase enzyme activity, and takes place at 145F. It lasts for 30 minutes (up to 45). The second step maximizes alpha amylase enzyme activity, and occurs at 158-162F. It also lasts for 30 minutes (up to 45 if needed to complete conversion). These steps are followed by a traditional mash-out at 170F for 10-15 minutes. This allows the mash to complete in 70-100 minutes. Theoretically, this 70-minute mash will result in a more complete conversion than a single-step mash that runs over a longer period of time, since the Hochkurz mash gives each of the two main amylase enzymes a chance to work at their optimal temperature. With a brewing system like The Grainfather, performing a Hochkurz mash is pretty simple. Fill the kettle with water, set the 145F starting temp, add the grain, and wait 30 minutes. Then change the temp to 160F, and wait 30 minutes more. Finally, set to 170F and sparge after 10 minutes. If you're using hot water infusions to raise the temperature of the mash, you'll want to start with a thicker mash for the first step so that the additional hot water doesn't dilute the wort too much. According to some of the sources I've read, this is an excellent general purpose mash schedule. While there are some beer styles (lagers in particular) that will benefit from a different schedule, most will do well with Hochkurz and will show a higher brewhouse efficiency too. A while ago, I read something about Mandarina Bavaria hops. One of the brewing sites had them on sale at the time. They said the hops can impart a mandarin orange aroma and flavor to a beer. I had no idea what I would do with them, but I bought some anyway. After doing some thinking about it, I thought they sounded like they might go well in a blonde ale. 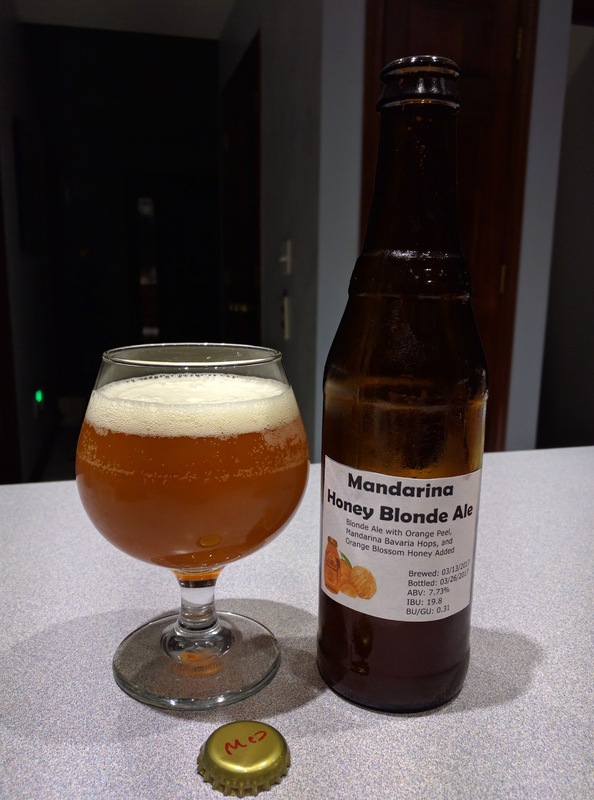 I thought a nice malty blonde ale with some added bitter orange peel and sweet orange peel, combined with a couple of healthy later additions of Mandarina Bavaria hops would create a very nice spring or summer beer. Not having a ton of faith in my recipe creation skills, I decided to do a 3-gallon batch for this one (or 3.9 gallons before shrinkage, trub, and other losses). I also wanted to see if The Grainfather boiled a batch any harder if it was a smaller size, and if this impacted chill haze. 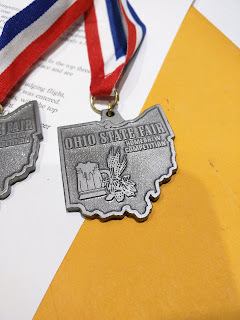 Update 06/04/2017: This beer took second place in the fruit beer category at the Ohio State Fair's 2017 Homebrewing Competition. This was the first time I've ever competed with a beer, so it was gratifying to see it place so well. You might be wondering the "why" of some of the ingredients. The Munich Malt is there to sweeten the beer and add some body. The Carapils is there to help generate a nice head. The Caramel 60L should add a slight reddish or orange-ish color to the beer, to help visually evoke the orange flavors and aromas. I used Tettnang for bittering just to hopefully add a little complexity. Mandarina Bavaria is there, as I noted earlier, to give a good mandarin orange flavor and aroma. The orange peel varieties are present to punch that up a little more. I'm even considering adding some in the secondary, but we'll see. This is the first time I've really done a recipe from the ground up, so it will be interesting to see how it comes out. I used The Grainfather's water calculation formulas to determine that I would need 3 gallons of mash water and 1.75 gallons of sparge water. I decanted these amounts in The Grainfather and my mash water heating setup and kicked on the heating elements. According to my calculations, The Grainfather formula resulted in a mash thickness of approximately 2 quarts of water per pound of grain. I knew that would drag down the efficiency of the enzymes, so I increased my mash time to 90 minutes for this batch to hopefully allow for a full conversion. The grains were mashed at 152F for 75 minutes, followed by 15 minutes at 156F, and then a 10-minute mash out at 167F. I sparged the grains with the water. My expected kettle volume post-sparge and pre-boil was 4.2 gallons approximately. In reality, I ended up with about 4.1 gallons at a gravity of 10.2 versus the 10.1 I expected. 75 minutes: No additions, just a straight boil of the wort. I expected a post-boil volume of 3.7 gallons. By time trub and shrinkage kicked in, that would work out to about 3.0-3.1 gallons in the fermenter. The reality turned out to be a post-boil volume around 3.5 or 3.6 gallons, with just a little under 3 (best guess) in the fermenter. The Grainfather's counterflow chiller again did an amazing job, with wort flowing into the fermenter at approximately 64.5F. My expected original gravity was 11.9 Brix, but I achieved 13.1 Brix at a lower volume of wort. The wort was pumped into a sanitized SS Brewing Technologies Brewmaster Bucket. Given the small volume, relatively low gravity, and low ambient temperature in the basement this time of year, I decided to forego any temperature control during the first stage of fermentation. A taste test after two weeks of primary fermentation would hopefully tell me if the beer would benefit from lagering at 50F for a while or could be dosed with gelatin and cold-crashed to clarify. Update 3/18/2017: I extracted a sample from the fermenter last night to see how it's coming along. It has a good light color. Since we're still mid-fermentation its aroma had a good bit of diacetyl to it. The beer itself was surprisingly dry and bitter. There was some hint of orange to it, but not what I expected. I boiled 16 ounces of water, then dissolved 16 ounces of Orange Blossom Honey in it. When this cooled, I added it to the fermenter. Update 3/24/2017: While home ill with the flu (a strain I wouldn't wish on anyone), I took a moment to check on the beer. Fermentation was complete, reading 6.7 Brix which BeerSmith and I worked out to 1.004 SG or 1.0 Brix when adjusted for alcohol. Needless to say it's very dry, but the orange element comes through clearly in the flavor and the color is lighter than I expected. It seemed very cloudy still, so I added gelatin finings and began cold-crashing it in the mini-fridge. If the last remnants of this illness are gone by then, I'm hoping to bottle it Sunday. That would have it ready for tasting around April 9. 3/26/2017: The beer was bottled today with my wife's help. It was bottled at 43F and yielded 3.25 gallons according to the bottling bucket markings. However, this yielded a total of 32 12-ounce bottles - an even 3 gallons - so I question the bucket's markings. Carbonation sugar of 2.5 ounces was added based on BeerSmith's calculation that this would generate 2.8 volumes of CO2 in the finished beer, which is good for the style. The gelatin finings appeared to have improved the clarity of the beer significantly. I expect that to improve further after carbonation and extended refrigeration. This beer was an experiment on several levels. I wanted to develop a nice citrus beer with strong notes of orange, maybe even bordering on overkill. I wanted to try brewing a 3-gallon batch in The Grainfather instead of my usual 5 and 6 gallon batches, to see if a smaller batch boiled any harder. I have wondered if one cause of the haze in my beers is the somewhat weak rolling boil The Grainfather does. That's something I plan to test after primary fermentation is over. I'll be back to add more notes after bottling, which should be March 26, 2017. April 15, 2017: The beer has been bottled and carbonated. It generates a nice creamy white head that lasts a while before incorporating into the glass and leaving behind some spotty lacing. The aroma is malty and slightly orange. The color is an amberish gold and as of this writing it's a bit hazy. I plan to condition the bottles in the fridge for a week or two before tasting again. The flavor starts with a mild bitterness, some orange peel, a bit of malt sweetness, and a final bitterness that's reminiscent of the pith of an orange. The orange flavor and aroma is far more subtle than I expected, given all the items that went into this. Still, it's a very nice beer that's really easy to drink. May 22, 2017: Although I am personally very pleased with this beer, the response I've gotten from others has been less enthusiastic. Most who have tried it simply say it's "OK" or "too bitter" to suit them. Regardless, I've entered it as a fruit beer in a state-wide competition. I won't know until mid-to-late June how it did. I'll be back to share the feedback when I have it. June 10, 2017: This beer took second place in the fruit beer category at the Ohio State Fair, with a final score of 38/50. Flavor: Caramel malt and mildly bitter hops. Dry but the honey comes through ever so slightly. Slightly bitter aftertaste but not too offensive. Hops have a nice spice too. Score: 16/20. Shift hops additions: Shift toward more late-boil hops and less in the bittering addition, maybe reducing Tettnang to give the Mandarina Bavaria hops a better chance to shine. Orange zest in secondary: I'd really have liked to see more orange aroma come through. Maybe taking some fresh orange zest and adding it to secondary just prior to bottling would help bring that out. Increase mash temp: A slight increase in mash temp would improve the body of this beer, which would help a little. I don't want to increase the body too much as I think it's pretty close to what it should be, but a 1-3F increase would probably improve it. Brew the base beer without orange additions: I built this recipe kind of from the ground up to be what it was, but one judge said that they bet the base beer was great, too. I've never brewed the base beer alone, so that seems like something good to try. Basically I'd drop out the honey and the orange peel, and leave the rest.